One of the world’s fastest growing Fun Runwith close to 10,000 in attendance, The Music Run™by Philam Lifefilled the Philippine Arena in Santa Maria, Bulacan today with both great music and enthusiastic runners. Runners and music enthusiasts of all ages from all over the country flocked to the Music Village in the iconic stadium to be a part of the country’s biggest and boldest run of the year. The Music Run™ by Philam Life started off with a pre-party featuring a live performance by popular Rock band SpongeCola (presented by Globe Telecom), followed by a warm-up session led by Official Fitness Partner Gold’s Gym to limber up Music Runners™ in the lead up to the flag off. At 4PM, Chief Executive Officer of Presenting Sponsor Philam Life, J. Axel Bromley signaled the first wave of runners to hit the pavements, sending an energetic crowd of Music Runners™ on their way through the five-kilometer soundscape. The run took its Music Runners™ through an exciting odyssey of sound with five different Music Zones—Rock, Pop, Old School, Hip Hop, and Dance—with concert quality speakers lined throughout the entire course, immersing the crowd with great music. The course then led runners straight to the After Party, featuring local DJ Deuce Manila and DJ Sam Withers from Australia. Music Runners were treated to a spectacular fireworks display at the end. 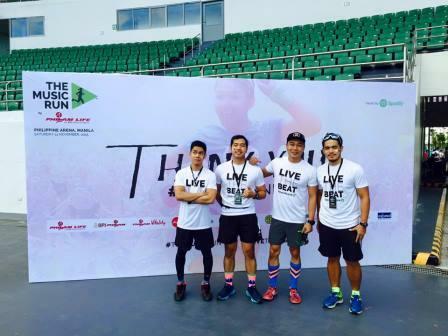 Unlike other marathons and themed running events, The Music Run™ by Philam Life had no time limit, which meantno pressure for runners to finish the course, allowing them to enjoy it as much as they want to. Medals were given out as a reward from Philam Life to every participant at the finish line. The runners also enjoyed a complete suite of health and wellness activities and perks from Philam Life such as financial health check and needs analysis at the Real Life Planner booth, sports and fitness challenges at the Philam Vitality area, and relaxation and wellness activities at the BPI-Philam station. “We understand that health has become a primary life goal among Filipinos. 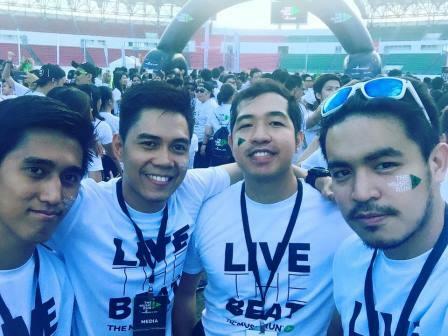 We want to help them achieve this by encouraging them to embrace a healthier lifestyle and live longer, more active lives, through health campaigns and wellness activities such as The Music Run™,” said Philam Life CEO J. Axel Bromley. As the Event Promoter of The Music Run™ across Asia, Executive Director of Exceed Sports & Entertainment Martin Capstick believes that the combination of music and running forms a powerful connection with today’s modern generation. 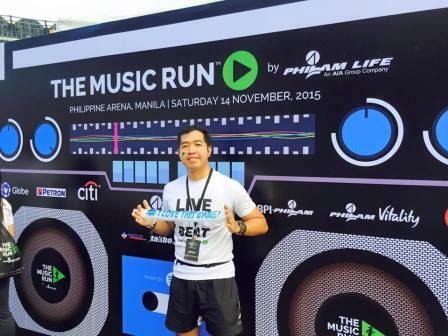 “With the resounding success of The Music Run™ in the cities we have been to, we are proud to bringit to the Philippines for the first time.” He adds, “Music and running always go hand in hand in a way that allows fitness buffs and casual runners alike to enjoy running to the rhythm of the beat. With The Music Run™, we are excited to build a community of Music Runners™ whom we put at the heart of this experience by inviting them to decide on the songs they want to listen to during the run,” he said. Music that was played during the run werechosen by the runners themselves. With the tagline,Your music, Your beat™, Music runners™ voted for their favorite tracks in each music genre. The top five picks became the music zone playlists for the run. The Music Run™ partnered with Spotify to build this bespoke digital music selection mechanic that crowd-sources the songs for the run. “The concept of The Music Run™ is a natural fit with Spotify – Music is a big part of the running experience and we are very excited to have The Music Run™ leverage on Spotify’s wealth of music data, content and an understanding of listening habits to create playlists for their upcoming run in the Philippines, our fastest-growing market in Asia,” says Sunita Kaur, Managing Director, Spotify (Asia). The Music Run™ is one of the fastest growing fun running events in the world, and the success it found in Manila may mean another run in the upcoming years. 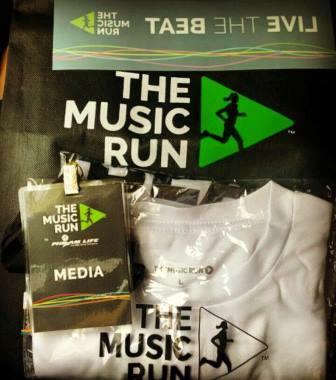 Launched in 2014 by Fresh Events Global, The Music Run™ is the only 5km fun run that puts music at its heart. For music lovers, casual runners and fun seekers, the bespoke digital music selection mechanic lets fans play DJ and help decide the music they want to listen to across 5km’s with five different beats. The Music Run™ is a total music immersion with Music Every Step of the Way™. Philam Life has P226.8 billion in total assets as of 31 December 2014 and has delivered timely pay outs of over P9 billion in education benefits (2004-2014) and over P118 billion in insurance benefits (1950-2014), while serving close to 600,000 individual policyholders and over 1,700,000 insured group members. Philam Life understands the real-life needs of its customers and provides the right plans and the right solutions including life protection, health insurance, savings, education, retirement, investment, group and credit life insurance. It also offers bancassurance and fund management products and services through its subsidiaries - BPI Philam Life Assurance Company (BPI-Philam) and Philam Asset Management Inc. (PAMI). Since its launch in Sweden I 2008, Spotify has driven more than US$3bn to rights holders. Spotify is now the second biggest source of digital music revenue for labels in Europe, and the biggest and most successful music streaming service of its kind globally. Get Ready for a Basketball with the Stars! SMART Brings iPhone 6s and iPhone 6s Plus!